You can breathe a sigh relief if you have been searching for a reliable resource for cooling tower maintenance, a cooling tower repair, or cooling tower cleaning in Washington, DC. Air Cleaning Technologies (ACT) is widely regarded as the most trusted commercial HVAC contractor serving the Capital Beltway. We are the best at what we do because we hire the most qualified technicians in the area. They are equipped with everything that they need to effectively and efficiently complete all cooling tower maintenance, cooling tower cleaning, and cooling tower repair assignments. Clearly, our nation’s capital is considered by many people to be the most important city in the entire world. It attracts visitors annually that want to see the United States Capitol, the White House, the Lincoln Memorial, the Vietnam Veterans Memorial, the National Mall, the Washington Monument, and the Jefferson Memorial. There are also spectacular museums, including the Smithsonian Institution, the National Air and Space Museum, and the National Museum of African American History and Culture. It is truly an honor to be able to provide cooling tower repairs, cooling tower cleaning, and cooling tower maintenance in Washington, DC. You can rely on us for a rapid response if you ever find yourself in an emergency situation, and we work efficiently to minimize disruptions. Plus, our highly skilled technicians are very well equipped, so we usually complete our assignments on the first visit. We have a comprehensive understanding of all of the components that are part of commercial air conditioning systems. The air handler serves a very important purpose, and air handler repairs are in our wheelhouse. And as we have stated, when you need an air handler repair in Washington, DC, will be on the scene in a flash, and we get the job done right the first time, every time. You can actually limit the need for air handler repairs if you conduct the appropriate air handler maintenance on an ongoing basis, and air handler maintenance is another service that we provide. There is a small cost involved, but a system that is functioning at peak efficiency will save you money in the long run. 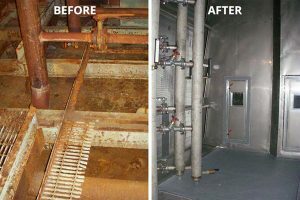 Whenever you need a cooling tower repair, cooling tower maintenance, cooling tower cleaning, an air handler repair, or air handler maintenance in Washington, DC, call ACT at 703-547-1680.